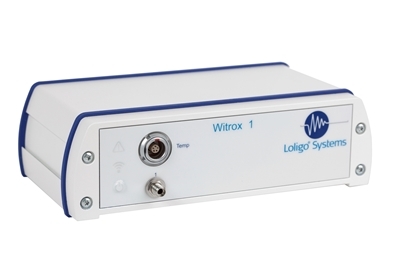 WITROX 1 is a single-channel oxygen instrument for use with fiber optic mini sensors (optodes). It has a build-in Bluetooth transmitter for wireless PC communication, and includes a high accuracy temperature sensor and software for unbeaten compensation of oxygen data to changes in temperature, salinity or barometric pressure in real-time. We developed WITROX 1 for the most challenging environments and applications. The wireless Bluetooth 2.0 communication allows you to keep that vulnerable PC/Notebook at a distance avoiding hazards like water or blood. Also problems associated with USB and serial communication are avoided, and the rugged compact design offers excellent protection and take up minimum bench space. 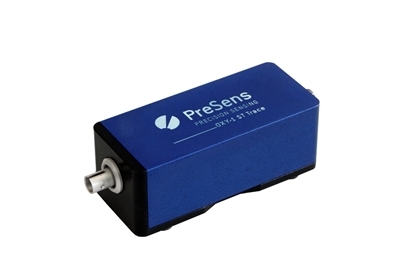 The instrument comes with easy-to-use software for Windows, and a 4-wire Pt1000 temperature sensor (Class B 1/3 DIN) with +/- 0.15 °C accuracy for 5-digits real-time compensation of oxygen data. A PC computer with Bluetooth 2.0 or higher (build-in or dongle) is required for operation. 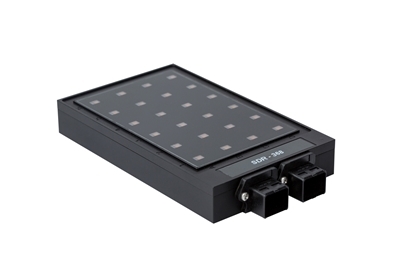 The instrument LEDs emit blue-green light that excites the oxygen mini sensor (optode) to emit fluorescence. If the oxygen sensitive dye encounters an oxygen molecule, the excess energy is transferred to the oxygen molecule in a non-radiative transfer, decreasing or quenching the fluorescence signal. The degree of quenching correlates to the partial pressure of oxygen inside the dye matrix, which is in dynamic equilibrium with oxygen in the sample. The decay time measurement is internally referenced. For more details and a diagram on this measurment principle go to our FAQ. 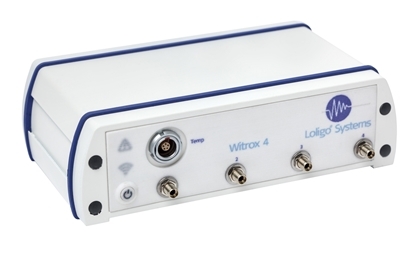 WITROX 4 is a four-channel oxygen instrument for use with fiber optic mini sensors (optodes). It has a build-in Bluetooth transmitter for wireless PC communication, and includes a high accuracy temperature sensor and software for compensation of oxygen data to changes in temperature, salinity or barometric pressure in real-time. We developed WITROX 4 for the most challenging environments and applications. The wireless Bluetooth 2.0 communication allows you to keep that vulnerable PC/Notebook at a distance avoiding hazards like water or blood. Also problems associated with USB and serial communication are avoided, and the rugged compact design offers excellent protection and take up minimum bench space. This complete system will monitor oxygen saturation in sea or fresh water, and regulate to hypoxic/hyperoxic levels with optional accessories. A large instrument display, two digital relays for valve control, menu-driven settings and an analog output for data acquisition, makes this system user friendly and well suited for a range of lab applications. Example of hypoxic control: the set point value is compared with the measured value. If oxygen saturation is higher than the set point value, the digital relay activates an (optional) solenoid valve to open for injection of nitrogen gas. When the measured value again reaches a value below the set point, the relay de-activates the valve. This extra microplate reader comes with a cable for connecting it to a full microplate reader set (#OX11900). You can daisy-chain up to nine of these extra readers to the first (full) one to get a total of 10 x 24 = 240 oxygen channels operated from a single PC. Please consider optional MicroResp™ software for enhanced performance of the reader and quality of oxygen data. Use this 24-channel optical flourescence oxygen system for high through-put (closed) microplate respirometry, or for monitoring oxygen conditions in (open) disposable plastic well plates. Using this reader with our re-usable 24-well glass microplates, oxygen consumption rates of tiny organisms can be measured in real-time inside 80-1,700 µl closed gas-tight wells fitted with non-invasive and re-usable oxygen sensor spots. Up to 9 extra, and less costly, readers can be daisy-chained to the reader and splitter box included in this system, e.g. for real-time measuremements of oxygen in up to 240 wells from a a single PC. 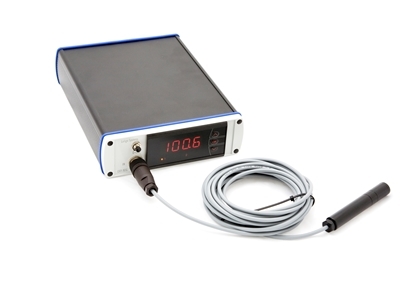 Use this single-channel oxygen meter with standard fiber optic microsensors for 0-100% O2 range and trace sensors for 0-10 % O2 range, e.g., for invasive physiology, micro profiling etc. The device is powered via USB and has a temperature channel for real-time compensation of oxygen values if connecting an optional Pt100 temperature sensor. Windows software is included, and several devices can be controlled simultaneously from a single PC.